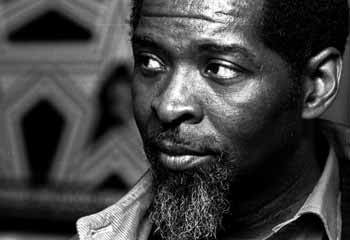 Alexander Hawkins' appreciation of MUHAL RICHARD ABRAMS, who died in late October, has been achieved via his recordings. He reflects on the importance of the composer, pianist and educator. I met Muhal Richard Abrams only once; and the strange thing is that I met him certainly before I knew his music in any detail, and indeed, almost before I’d heard it at all (though I was passingly familiar with a couple of bits and pieces – I’m pretty sure I had a nice vinyl of him playing with Kenny Dorham by that stage). It was at the North Sea Jazz Festival in the days when it was still held in The Hague; and mid-performance, there was a fire alarm. Listening as I was from close to the stage, my nearest fire exit was out through the stage door, and so I ended up milling around with various musicians and crew whilst we waited for the all-clear. This is really a ‘non-story’ – there’s no more to it than this – save that I happened to exchange a few words with Muhal: telling him how much I was enjoying the set and so on. But nonetheless, this was the point at which I really decided to start the journey deeper into his music. Of course, in practice, this had to be through the recorded legacy, since I’m not aware that he ever visited the UK subsequent to this date; and now sadly, after his recent passing, all such future journeys will have to be through the recorded legacy. Is there a designation even more ‘niche’ than ‘musicians’ musician’? If so, it might meaningfully be applied to Muhal, at least insofar as he is perceived in this country. And yet however ‘underground’ his reputation, on listening to his music, it becomes more and more apparent quite how profound his influence has been on many major names and movements within the contemporary scene. Take an album such as 1978’s 1-OQA+19. With historical perspective, in the opening track alone (Charlie in the Parker) we can hear pre-echoes of Henry Threadgill’s later work (listen as Threadgill obsessively worries the intervallic material of the composition); of Steve Coleman (in the piece’s rhythmic language); and of the likes of Vijay Iyer (such as in the cyclical use of the materials by the rhythm section). Elsewhere in the album, we can hear a radical austerity which might be heard as prefiguring, for example, some of Tyshawn Sorey’s work (and which in Abrams’ own work, reached arguably its zenith in the recent trio with Roscoe Mitchell and George Lewis); a personal approach to dealing with text within a musical framework; a take on the type of minimalism with which the Art Ensemble of Chicago often also dealt; incandescent post-bop; and much else besides. Abrams’ work is also important for thinking about 'the tradition' as a tradition of innovation, contrary to the conservative ‘re-creation as tradition’ narratives which were to become dominant throughout the 1980s (consider too the AACM's moniker 'Great Black Music, Ancient to Future': in part a way of breaking free from the stereotypes which would seek to limit these musicians simply to the pigeon-hole of 'jazz', whatever this might be). Many of Muhal’s large and mid-size ensemble works on the Black Saint label from this period bear out the breadth of his conception as regards ‘tradition’ magnificently. Throughout the period, we can hear his writing at once explicitly recalling the likes of Jimmie Lunceford and Duke Ellington, at the same time as completely organically providing springboards into the most contemporary of soundworlds (bear in mind the title of his early Delmark album, Things to Come From Those Now Gone). The recalling of the past could be by turns unashamedly explicit (but always, crucially, un-mannered), or gloriously subtle, and frequently within the same piece: consider the deliberately ‘old-timey’ use of the plunger mute in a composition such as the title track from the album Mama and Daddy, alongside the delicately-voiced duets variously with clarinet and violin, which throughout this track somehow bring to mind nothing quite so much as Ellington’s masterful scoring of Up and Down… from Such Sweet Thunder. Interpolated in amongst all this are double-time passages which contain linguistic hints of the likes of Woody Shaw (Muhal had of course played on Shaw’s wonderful Muse album Iron Men); and also clear reminders that the pianist is from the city which gave us the likes of Jimmy Yancey and Albert Ammons. Yet whilst the end product is nothing but Abrams, his compositional genius has created a platform for soloists which allows them too a complete expression of their character (that couldn’t be anyone other than George Lewis later in the track, for example): another deep kinship in approach he shares with Ellington. This treatment of the tradition as a living thing, and as a resource rather than a prescription, has been deeply influential on a number of significant writers from a younger generation - take, for example, the ensemble work of Taylor Ho Bynum (whose New Yorker tribute to Abrams should not be missed - Link at end). But even if Abrams had never stood in front of his own ensemble, like Ellington, he would have to be reckoned a giant on the basis of his piano playing alone. He eschewed the cluster-driven, gestural approach of Cecil Taylor, as well as the then-emerging mainstream orthodoxy of the post-Evans/Hancock soundworlds. At mid-tempo and upwards, he would play bop-derived lines with a headlong rhythmic drive which recalls Bud Powell - especially, to my ears, the later Powell, who could sound at once (and in equal measures) thrillingly precarious and utterly deliberate. Solo - a context which he visited over the course of his career, from the early classic Young at Heart/Wise in Time, via Afrisong (perhaps my personal favourite), to the more recent Vision Towards Essence - he feels more contemplative, occasionally dealing in a very particular, luminous near-impressionism. All the while, he seems to share a characteristic with his fellow Chicagoan, Fred Anderson: that of meandering through a composition, at the same time as making every move seem inevitable. And if he never made an album in the classic piano trio format, he was undoubtedly a master of the duo: those with the likes of Anthony Braxton, Malachi Favors, Leroy Jenkins and Amina Claudine Myers are particular favourites of mine. But all of this is to miss what is surely one of the central pillars of Abrams' legacy: his presence as an organiser, teacher, philosopher, and galvanising force more generally. As a co-founder of the Association for the Advancement of Creative Musicians, his presence and activity should be taken as prophetic by many of today's musicians, existing as we do in a musical ecology increasingly based on a grass roots, self-help ethos. He was responsible for creating an organisational structure in 1960s Chicago which was able to promote new music, and music education, completely outside the conventional commercial channels (as Sun Ra had begun to do in his very different way in that city some years earlier, and as other unsung masters such as Horace Tapscott would do in their own way in other cities). Yet form and substance were linked: and much of Abrams’ genius was in being able to forge an ethos of true collectivity, which nevertheless could coherently accommodate - even within the context of a single group, in the case of the legendary, unrecorded Experimental Band - and nurture some of the most fiercely radical musical individualists of the last half century (the likes of Braxton, Roscoe Mitchell, Threadgill, and so forth). Again, as with Ellington's organisations, the point seems political: that the individual can perfectly flourish within the mutual support system of a group, contrary to the caricature in the mainstream public political discourse of the USA. And even if these individuals were to go their own way in time, many (such as Braxton at Wesleyan, and Mitchell at Mills) went on to become crucial educators and facilitators in their own right, and themselves to inspire further generations of performer-educators. Though he did receive various accolades throughout his life (being, for instance, the first recipient of the prestigious Danish Jazzpar Prize), and was regarded as absolutely seminal amongst a certain musical community, Abrams never seemed to court or receive the broader public recognition which his crucial historical importance might otherwise warrant. Whether for himself, or equally as often for others, he was perhaps simply too busy getting stuff done.